This week I'm getting a little tricky. My good bloggy friend, Rach at Life Ever Since also hosts a Friday meme and I thought it would be fun to combine our posts one week. And since I like having guests here, I invited Rach to share her Life Lessons for this week as a guest post, instead of on her own blog. She will still have her linky open, so no worries! Rach is a new mom to a cute 10 month old girl we all call Donut. She lives in Texas with her "Do it Himself" hubby. She enjoys being crafty and she even knits and crochets like me! 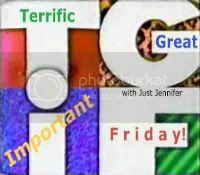 Yay, I’m so honored to be over at Jen’s today to host both TGIF and Life’s Lessons (I feel like I’m double hosting SNL by being both the featured actor and the musical guest). Anyhoo, thanks, Jen for having me here today! 1. I admit I was having a hard time being positive this week. 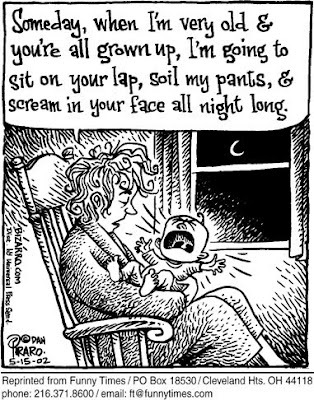 We’d had several bad nights of little sleep and I was exhausted before the day even began. 2. And when I’m tired, my mind wanders and my mood sinks. So Monday didn’t start off on a happy note. 3. As the week progressed, the sleep got better, but my mood didn’t. I was feeling a bit lonely and off this week. I blame the rainy and cold weather at the start of the week, which meant that Donut and I were pretty much home bound for a few days. 4. And then I started thinking about how it’s been a year since I’ve been a SAHM and I’m still struggling to find friends to really connect with. 5. When I start thinking those thoughts, I get pretty down. I try to be a good friend and make time for others. To check up on them, text or email (because I stink at actually talking on the phone and can’t hear half the time over the babbling of a baby and the barking of a dog). 6. So what do I do? I open my computer. And a bunch of you pop out on my screen. 7. You DM me or email me. You tweet with me and you leave me sweet comments on my blog. 8. You let me know I matter. 9. I know people who don’t blog who think this is weird. They wonder how we can even have connections online. And I admit I thought it was weird too. Until I started blogging and tweeting. And it’s been many months and some of you have been there through thick and thin. 10. So even though things may not be exactly how I envisioned my life as a SAHM, things are still pretty good. Thanks to you. Thanks again, Jen, for having me here today and for forgiving me about last week’s mix-up!! You’re a good pal. Aww, Rach! I will have you know I didn't make good mom friends til Cami was 3. I don't want that to discourage you. Rather, to let you know that I don't think it's easy for anyone, but that it should happen in time. And as far as online connections go....man do I seriously wanna meet IRL some of the people I've been getting to know online! Hmmm....what sort of funny shall I share this week.....? This is appropriate! So tell us, me and the voices Rach, what made you happy this week? and follow Rach on Twitter! Totally agree Rach! It is always nice to feel loved and like you matter! The bloggy community is utterly amazing. I feel like im closer to some of my bloggy friends than my IRL ones. I too hope I get to meet some of them, you and Rach included!